This beautiful handthrown ceramic* urn is glazed in three distinct multi-colored finishes which contain 22 karat gold. Choose from Blue or Pink finish. Neutral shown has been discontinued. 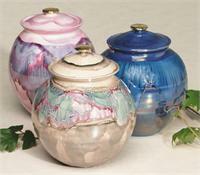 *Due to the nature of ceramics, colors and patterns may vary from those represented here.